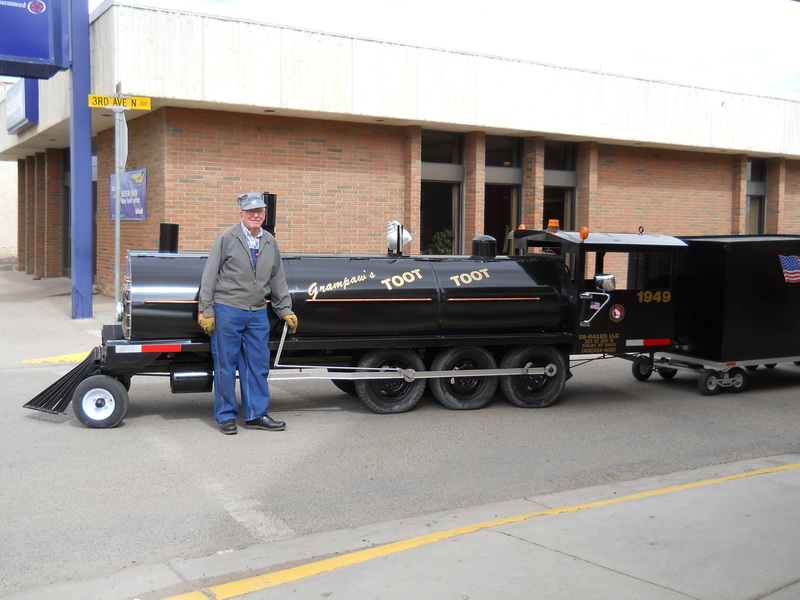 Cool Things to See and Do in Toole County MT | Sherrie Murphy says, visit us in Toole County Montana and have Cool Time! Sherrie Murphy says, visit us in Toole County Montana and have Cool Time! 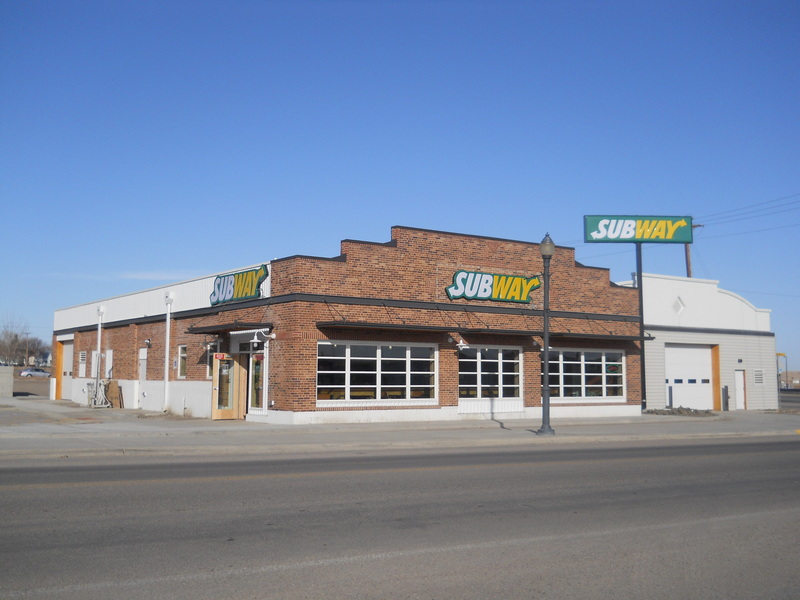 Subway has a new location in Shelby. 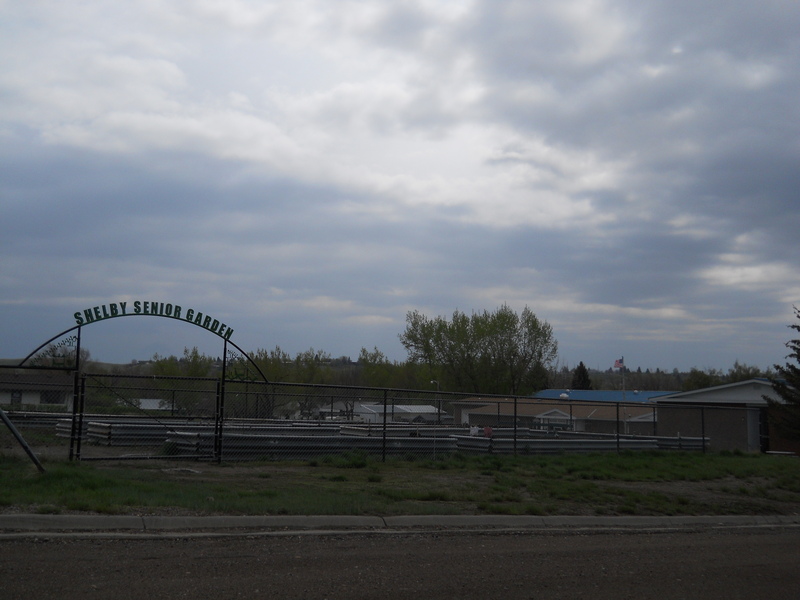 It is located near U.S. Highway 2, on 5th Avenue N. It is directly across from Albertsons. Hours are Monday-Friday 7:00 a.m. to 10:30 p.m., Saturday 8:00 a.m. to 11:00 p.m., and Sunday 9:00 a.m. to 9:30 p.m. Be sure to stop by and get your yummy “$5.00 footlong”. The Veterans Memorial Flag Monument is a beautiful tribute to our veterans. The memorial complex is a quarter mile south of Shelby on the frontage road. 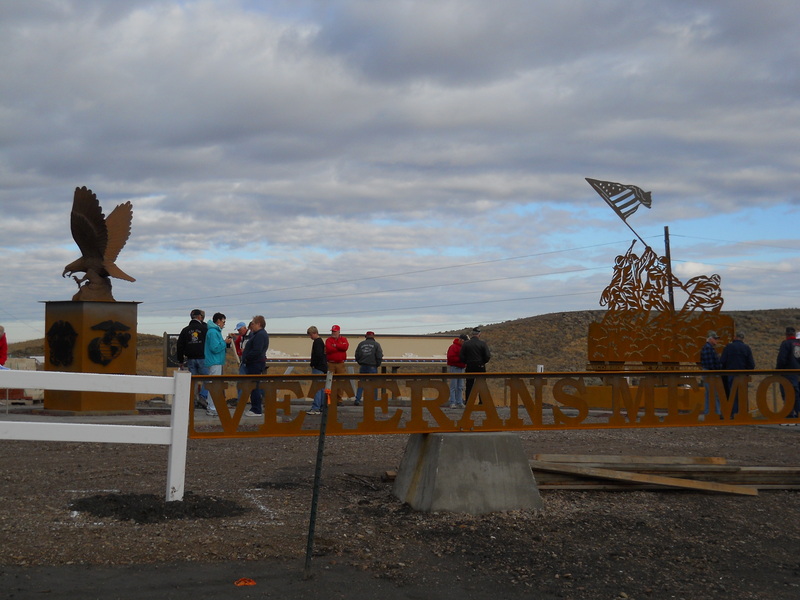 It includes an iron eagle standing on a pentagon steel stand displaying our five armed services: Army, Navy, Air Force, Marines and Coast Guard; the famous Iwo Jima image of the U.S. flag being raised – “Uncommon valor was a common virtue”, two brick tables displaying engraved bricks honoring local veterans; and two POW-MIA signs “You are not forgotten.” The bricks may be purchased to honor your favorite Montana veteran, and the funds will help maintain this monument and the nearby Veterans Memorial Flag. Local Veteran John Alstad is the talented artist who created the majority of this incredible memorial. Call Bob Longcake at 434-5567 to purchase bricks; prices of bricks are $400.00, $1,000.00, and $1,500.00. Montana Code of Judicial Conduct, Cannon 1 states that a Judge shall avoid impropriety and the appearance of impropriety at all times. I have removed all posts off Cooltoole.com, that are private property. Toole County is a wonderful place to live, and everyone has been very gracious to me, but I don’t feel it is my place to share private cool things with you. NATIVE WORDS, NATIVE WARRIORS will be displayed at the Marias Museum in Shelby, regular museum hours, during the month July, 2011. Cool Thing 129! The Open House is July 10, 2011 from 1:00 p.m. to 5:00 p.m.; and it includes an ice cream social. Share the information with everyone you know… the Toole County museum is providing a wonderful opportunity for everyone to see this Smithsonian traveling exhibit; it honors WWI and WWII Veterans, who were crucial in implementing a code that was never broken by the enemy! Admission is very reasonable! 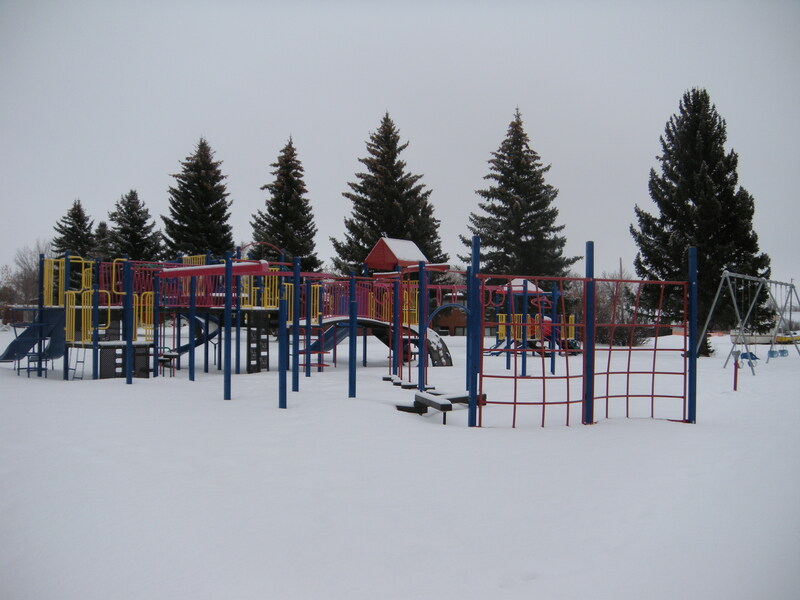 Aronow Park is located at the Valley / Turner intersection on the north end of Shelby, MT. The playground equipment is perfect for little ones; they will enjoy their day, while parents, or grandparents, watch the fun and relax. The park also features a volleyball court, barbecue grills and picnic tables. Great place to get out of the house, and enjoy Toole County. 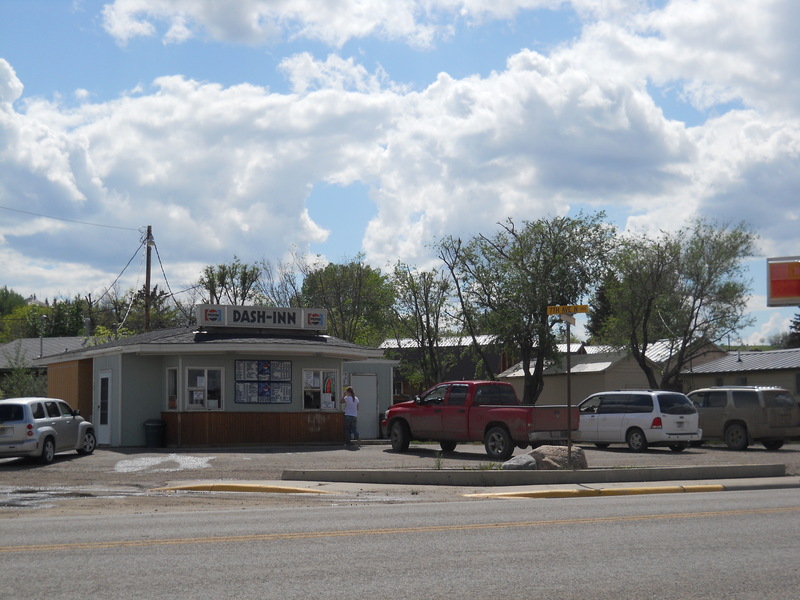 Drive up to the Dash Inn on U.S. Highway 2 and 7th Avenue North, in Shelby, Montana, for a great meal. The server will come out to your vehicle, take your order, and deliver a delicious, hot burger and fries to your car. A huckleberry milkshake, or ice cream, is refreshing on a hot day. The Dash Inn is open in the summer from 11:00 A.M. to 9:00 P.M.
My children taught me inline skating many years ago, and I still love ‘rollerblading’. Inline skates were developed for training Olympic ice skaters; the technique is very different from roller skating. Inline skating is much easier on the knees than running, and it is wonderful recreation! I never learned how to stop sufficiently at high speeds, but I learned that I could do a beautiful pirouette (I think it was beautiful), and come to a sudden stop. Broken ribs aren’t much fun, but I did get stopped. 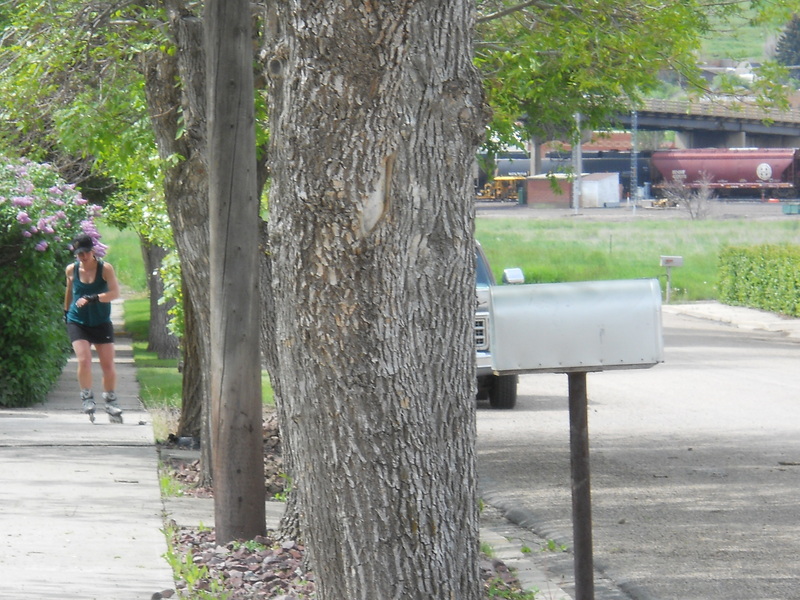 Dust off your roller blades, hit the Roadrunner Trail, and don’t go too fast! Have fun! 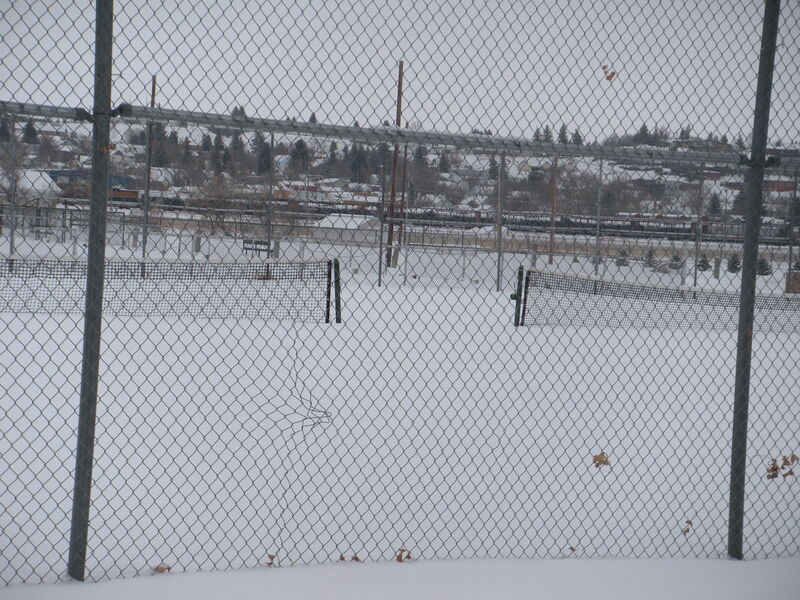 Land Water and Conservation Fund helped build these tennis courts in Shelby, MT. Three available tennis courts at the Valley/Turner intersection provide an opportunity for some great recreation. I tried tennis when I was younger, and I’ll be the cheerleader. Grab your tennis balls, racket and a partner and have some fun. No bike, boards or roller skates are allowed on the courts. 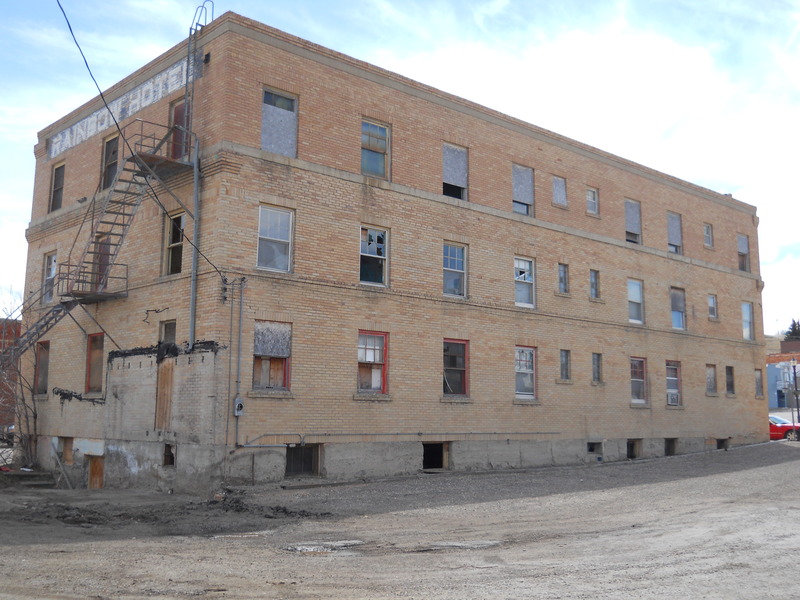 Owners of the Rainbow Hotel added a third story, that would pay for itself with reservations, for the Dempsey-Gibbons World Championship Fight. Mary Ann Potter bought the motel from relatives in 1975, and the motel closed its doors in 1988. Rooms could be rented for the night, and some rooms that could be rented monthly. Mrs. Potter sold the building to the City of Shelby, who now owns the motel. The Rainbow Motel is a bit tired, but a very cool building. The Rainbow Motel is located one block east of the Viaduct on Main Street in Shelby, MT. There are two community gardens in Shelby: The Senior Garden across from the Senior Center has 20 plots, most of them raised. The Shelby Community Garden, across from the SHS football field has 40 plots. Tools, hoses, sprinklers and water are available for the gardeners, and each gardener is responsible for planting, weeding and watering his own plot. Garden plots are available for a $25.00 fee each year, and a contract must be signed. Plots are available in April of each year. Call Casey Smith at 460-0639 if you are interested in a garden plot. Some residents established plots years ago, and the plots are reserved quickly. Good luck! The Oilmont Trojans were a force to be reckoned with in sports. This ‘victory’ bell rang when the Trojans were victorious, and also when it was time to buckle down and study. 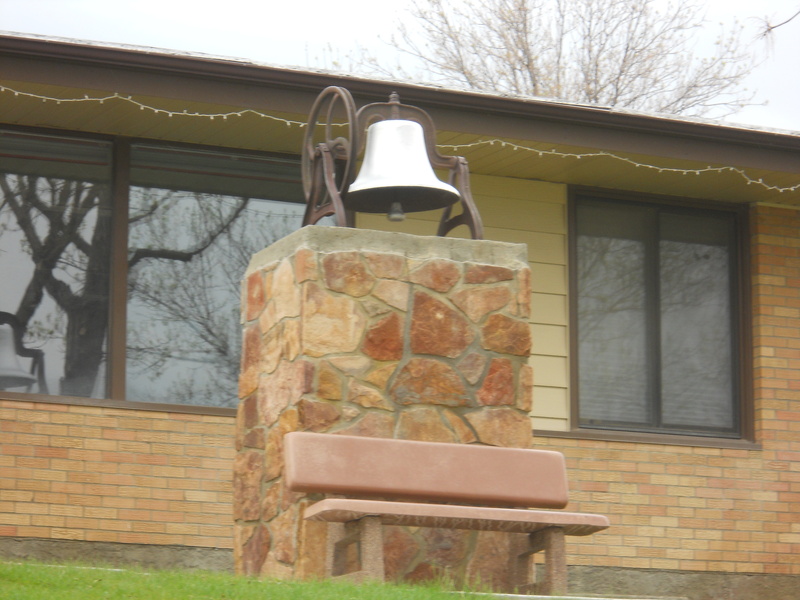 The pictured Oilmont School bell was donated to the Toole County Historical Society, to be displayed on the courthouse lawn in Shelby, Montana. The bell was dedicated during the bicentennial year, 1976, and is displayed in front of the Toole County Library. Earthtones Studios is filled with beautiful artwork, and the artist, Rhonda Wiegand, is obviously blessed with incredible talent. Her art has a story; and the story behind each painting, is printed near each piece. 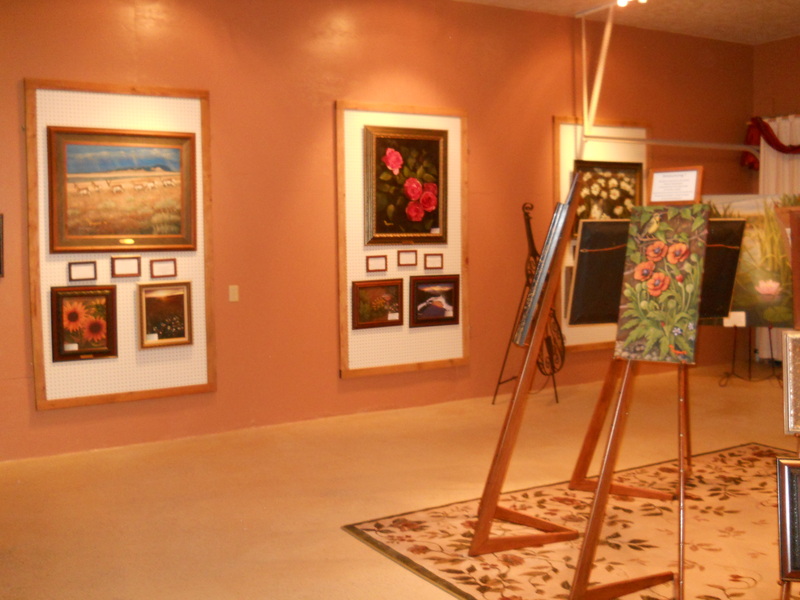 Her paintings bring much of Montana and Toole County to life; the artist sees the beauty in our surroundings, and shares it in her work, so everyone can see the beauty, too. 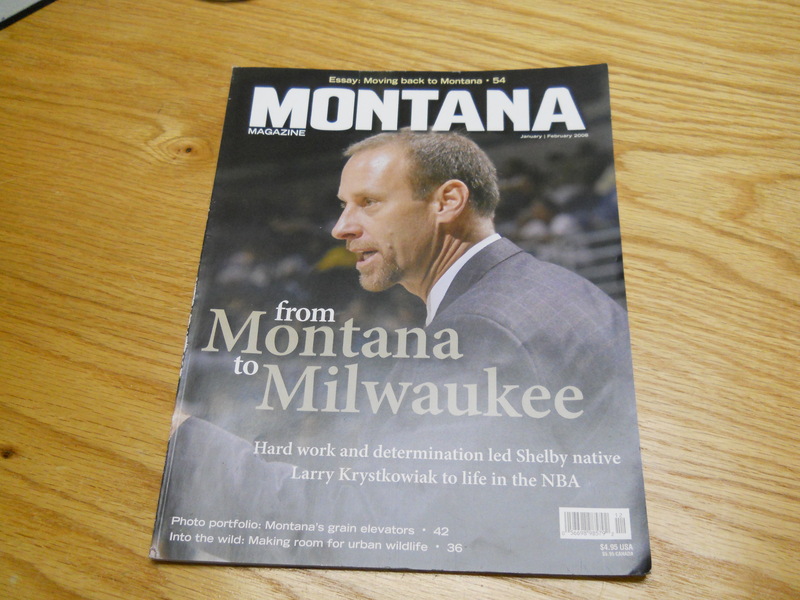 Former Shelby, Montana resident, Larry Krystkowiak, attended schools in Toole County, but graduated from high school in Missoula. He is 6’9″ (lucky him) and was a very skilled basketball player. He was honored by UM Griz, as they retired his #42 basketball jersey; he is remembered as the greatest player @ UofM. Krystkowiak played pro ball, but an injury ended his playing career. Krystkowiak started coaching after his injury, and is now head coach for the University of Utah men’s basketball. The Utes will shine under the direction and guidance of Coach K.
Every May, for eight years, the Montana Club has sponsored a poker run. 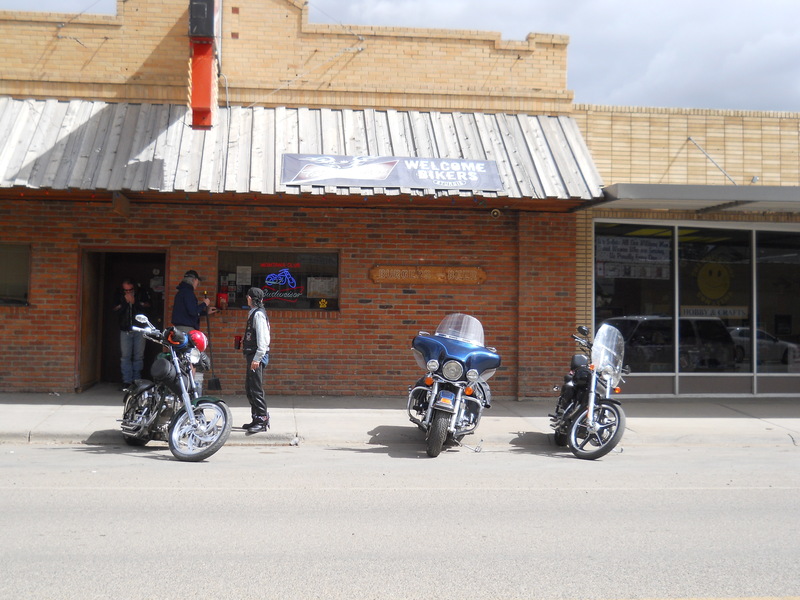 A biker starts in Brady, MT, to pickup his first card. He travels to Conrad, Cut Bank, Sweetgrass, Sunburst, and Four Corners to get cards for his poker hand. The final stop, and card, is at the Montana Club in Shelby. Music by Bones4Fido tops off the day. There is a 50/50 drawing, door prizes, and a pig roast. There is a second poker run in Toole County later in the summer. If you’re a gambling man, or not, get your bikes out, and join the fun. 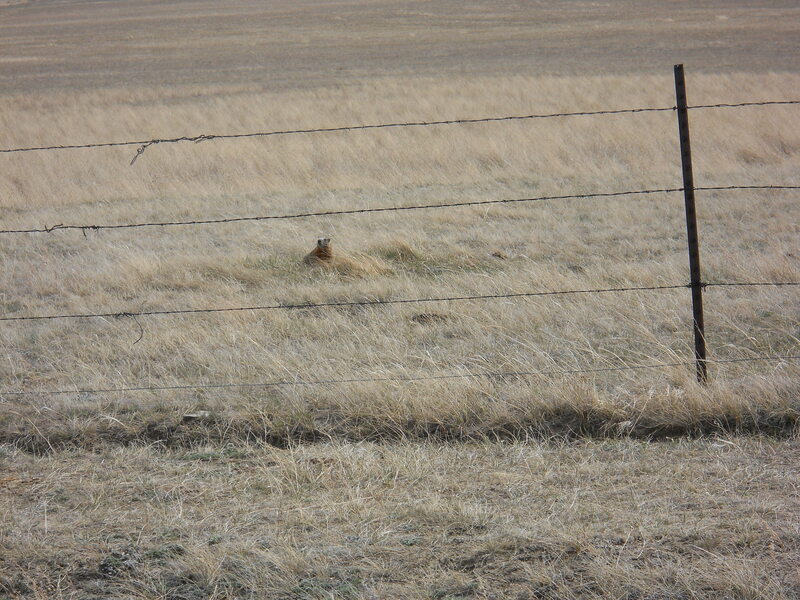 Rock Chucks (marmots) are a type of ground squirrel; the pictured rock chuck (marmot) makes his home in this field in Toole County. A marmot will whistle to warn it’s own that there is a predator nearby. Rocks Chucks believe in polygamy; the male will find several females; each female can give birth to 4-5 marmots per litter. Four wives! Ye gawds! Harry Benjamin farmed all his life in Toole County, and has used his hands to build incredible things. He left school in 8th grade to work on his family farm; he built a cab on his tractor at 14 yoa, to protect him from the cold and the weather. DE-RAILED is his newest creation; it was built in the last 6 months. Cool Thing # 87 is the colossal clock he created. Mr. Benjamin drove his incredible train downtown in Shelby; one car was loaded with toys for the children to ride. This steam engine train is over 60 feet long. Mr. Benjamin is not only intelligent, creative and talented; he is a very kind, honorable man!! His “Made in Montana” train is absolutely amazing. Very, very cool!!! You can purchase the”Sweetgrass Hills, a Natural and Cultural History” book, from the Sweetgrass Hills Protective Association, Chester, and Prairie Peddler in Shelby. Dr. Johan Dormaar, Lethbridge, AB, authored this wonderful, fact-filled book about the geology and rich history of the Sweet Grass Hills. The pictures show the beauty of the Hills, including the wildlife, flowers, and signs of life from many years ago. 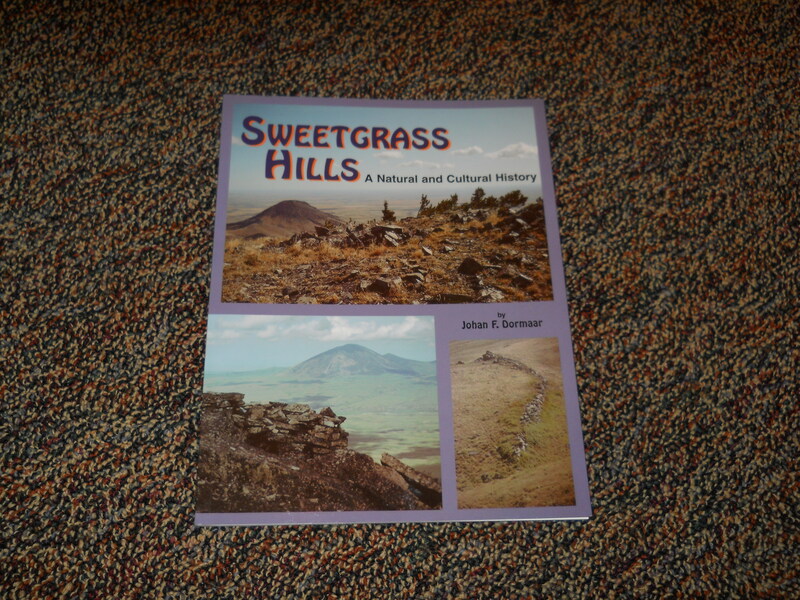 The Sweet Grass Hills were home to coal, gold and copper miners, sheep and cattle ranchers, Plains Indians and many more; the book has so much great information about our incredible Sweet Grass Hills. “I tracked down your information off the Cool Things to Do in Toole County. I have launched a meetup.com networking group in Shelby that will creatively combine things to do outdoors with existing resources, people, ideas and events. For instance, I am looking to organize float/kayak trip down the Marias River, carpools in winter to skiing, hiking for people like me to scenic/interesting areas in the wilderness or nearby, etc. If you have suggestions, I would love to have that input! This sounds like great fun for all of us who love the outdoors. Lance will talk about ‘meetup’, and his ideas, at the meeting. Please spread the word and I hope there is a great showing at the meeting. Check out the website – I love the idea of networking with others who enjoy Toole County and Montana. Mary Ann Potter, owner of Mary Ann-tiques, started her antique business in 1982, in her Rainbow Hotel. The antique store is now located at 413 Main Street, Suite 3, in Shelby. 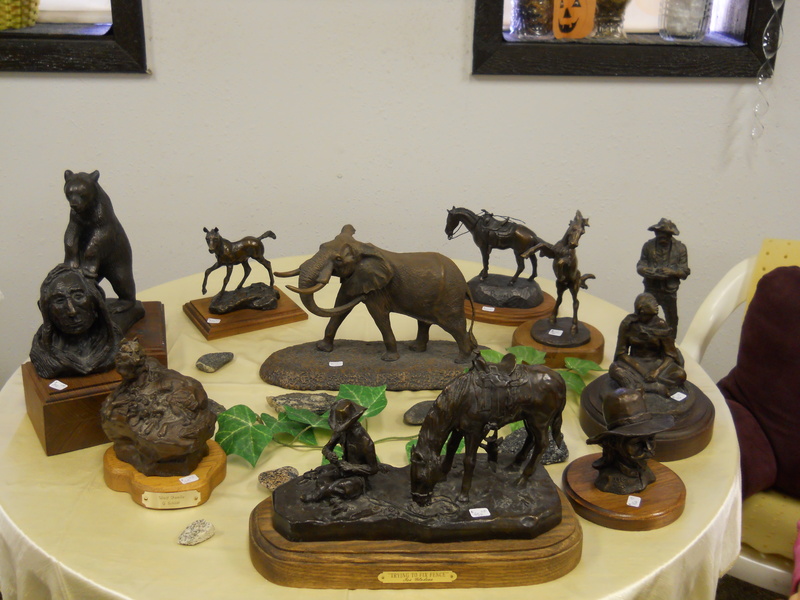 There is an assortment of antiques in her store, my favorites are the bronzes done by Shelby artist, Joe Gladeau, and area artists Gary Schildt, Gordon Monroe, and Ace Powell. Mary Ann-tiques is open Noon to 5:00 p.m., Tuesday through Saturday. If you have antique furniture that needs some TLC, Mrs. Potter can restore & refurbish it for you. Mary Ann-tiques has many Toole County treasures available for sale. Stop in, say hello to Mrs. Potter, and check out the merchandise; it may be your good fortune to find something you’ll cherish forever. 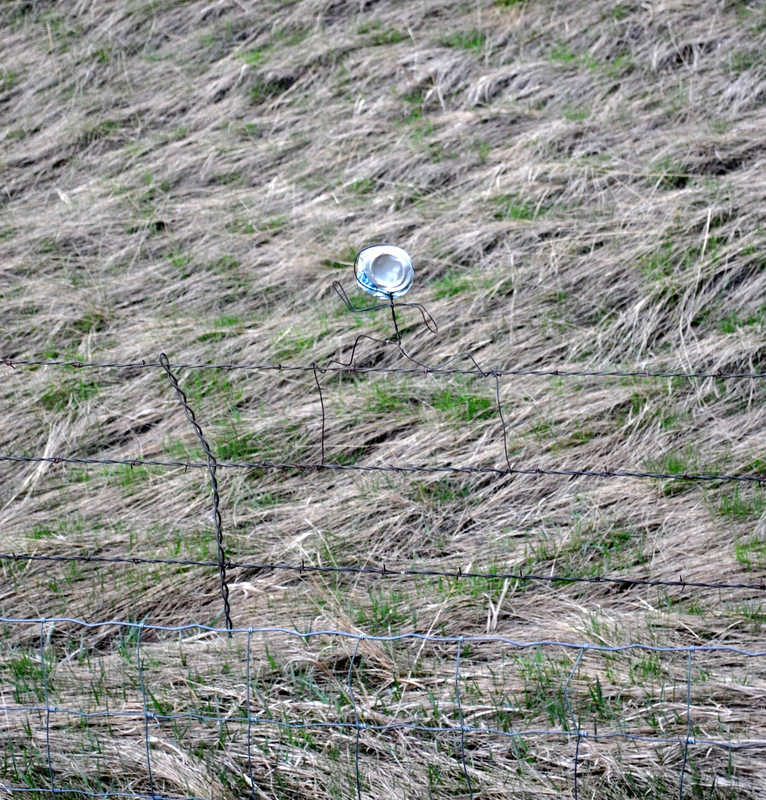 This barbed-wire runner was created by an unknown artist. The figure runs on the top wire of the highway right-of-way fence, east of I15, on Marias Valley Road (frontage road). This work of art is on the west side of the frontage road, just south of Heath Road (prison road), .3 miles south of mile marker 24,and south of Shelby. A Mountain Dew can is centered in the runner’s head. Thanks Steve Hurtig for the picture of this cool runner.